So I made my family's favorite cranberry sauce this morning before I took the kids to school at the request of my older daughter. 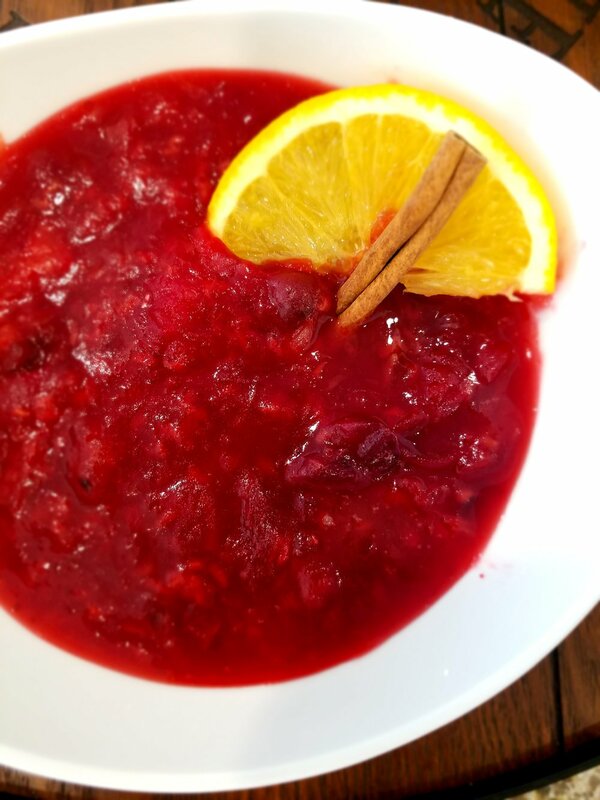 The great thing is that I had all of my ingredients ready to go and this cranberry sauce is so easy to whip together! Don't go out any buy canned sauce this Thanksgiving. Make your own and surprise your guests with a delicious homemade cranberry sauce! 1. Place cranberries, cinnamon stick and enough water to cover the cranberries in a 2 quart saucepan. Heat to boiling over medium-high heat. 2. Cook, stirring frequently, until cranberries begin to pop. 3. Reduce heat to low and add in honey, juice from 1/2 orange, diced 1/2 orange, and raspberries. Stir gently to combine. 4. Add in arrowroot to thicken sauce. Allow to cook for a few more minutes to allow flavors to mix and sauce to thicken to your liking. 5. Cool, remove cinnamon stick and enjoy! Remember the reason for the season - tO BE Thankful!